North Fork Native Plants has experience growing a wide range of wetland, riparian and upland plants. When our existing inventory cannot fit your specific plant material needs, we can custom grow plants to meet your exact species specifications. We also have extensive seed collection experience. Please call us to discuss the details of your needs, so we can help you to formulate a plan that works best for your project. The key to custom growing is good planning. In some cases, seed or starter material can be difficult to find and procure. This process can take several months depending on seed or plant availability. Another factor that can increase project timelines is the use of site-collected seed. 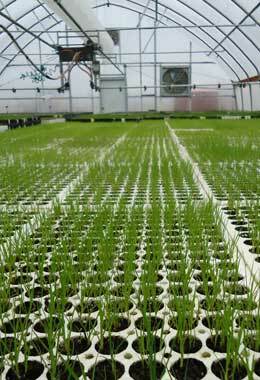 After the seed is procured, the plants need 4 months of stratification time, roughly 12 weeks of growing time, and 7-10 days to harden off from the greenhouse environment.